I cut out the central layer using the Big Shot and the Top Note die out of Confetti Cream cs. I trimmed the edge at literally the dotted line, then cut out another Top Note with Chocolate Chip cs to make a layer. The skaters from Winter Post were watercolored, cut out and bumped up on dimensionals. The trees in the background are from Lovely as a Tree and the "pond" is sponged on in Close to Cocoa ink, as are the edged of the Top Note. 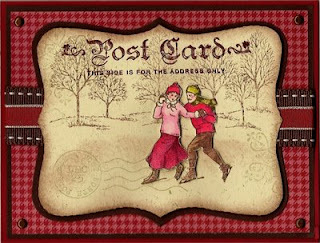 I also added the postmark and snowflake stamps from Winter Post in stamped-off Sahara Sand.